The 2017 Run for the Wall will be held in honor of Bobby J. Allen on November 11, 2017. 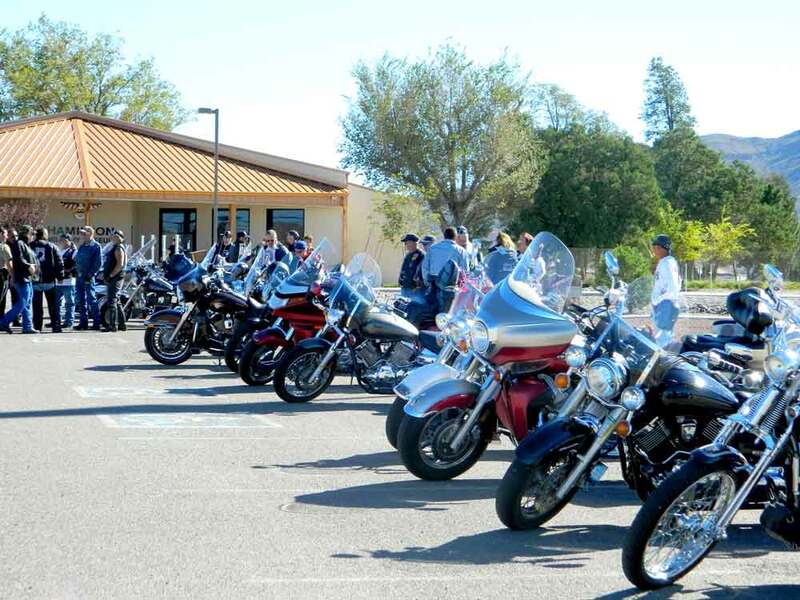 The event kicks off with a ceremony at 9am; registration for the Poker Run starts at 9:30. The Poker Run is open to motorcycles, cars and trucks; if it runs you can play! 5-card draw, best hand wins. A Tug-of-War follows the Poker Run; 2-person teams can enter for $10 per team. Vendors and food will be available at the Park throughout the day. Info: Windy Allen Barnes, 575-952-0484 or Maggie Allen, 575-740-1650. The Wall at Veterans Memorial Park is one of 4 replicas of the D.C. original that went on tour so that more people could experience the monument’s beauty and power. Two of the walls that traveled found permanent homes – ours here in Truth or Consequences, and another on the east coast. In the years since it was installed, the condition of our replica has deteriorated due to its exposure to the elements. The surface is flaking and peeling. The Veterans Memorial Park and the Hamilton Military Museum board members have worked over the past year to come up with a viable solution to deal with the issue. A granite version of the wall is available from the same manufacturer who made the replica that is currently in place. The VMP Board is working to raise enough funds to procure and install this granite monument. The cost of the granite Wall is $75,000. The Park Board has raised about half that amount. Memorial Day Weekend begins at 10am on Saturday, May 25 here at Veterans Memorial Park. A short program will be conducted by the talented Sam Parker of the VFW post in Williamsburg. The ROTC Color Guard featuring students from Hot Springs High School will perform. Afterward, visitors can tour the famous Hamilton Military Museum and a the Vietnam Wall War Memorial replica, and take a stroll along the Walk of Education. Everyone is invited to bring a tailgate picnic to share, and friends! Hope to see you there. Just a few photos of Veterans Memorial Park taken in 2013. The Park’s Memorial to Prisoners of War and soldiers Missing In Action was installed in March 2012. The sign was designed by Bobby Allen and created by Don Hearn at Desert Graphics Inc. The POW-MIA memorial sign can be viewed at Veterans Memorial Park 24/7/365. Dave Williams of Truth or Consequences donated this vintage ambulance to Veterans Memorial Park in late 2012. The ambulance was used during World War II. Board Members are currently on the hunt for authentic replacement tires. They also intend to restore the paint to an “army green,” but the dents and dings that occurred as result of its duty will be left intact. Visit Veterans Memorial Park – it’s open 24/7/365 – to see the WWII Ambulance! The Purple Heart memorial installed in front of the Hamilton Military Museum was conceived and drawn out by Bobby Allen. Bobby’s original idea was to use unpainted iron, which would weather and tarnish over time. After Bobby drew the pattern, it was cut out of iron by Don Hearn at Desert Graphics Inc. The Purple Heart was installed without paint and remained that way until everyone agreed that a coat of paint would make it more visible in front of the rock. Jia Apple of Haole Tita Art was called in for the job, and applied the appropriate colors using her deft painter’s hand. End result – great looking, impossible to miss, and a fitting tribute to an esteemed decoration! Visit Veterans Memorial Park – it’s open 24/7/365 – and see the Iwo Jima mural! Come out and show your support for the Truth or Consequences Veterans’ Memorial Park & Hamilton Military Museum during this fun and festive event! We’ll have food, music, the tug-of-war Tug-off at 3pm, and a Bike Run and Rodeo. Admission is free! Vendors will be on site, and the Veterans Day Car Show is right next door. Contact Bobby Allen with inquiries at 575-740-7111. Thanks for your interest in Run for the Wall 2011.